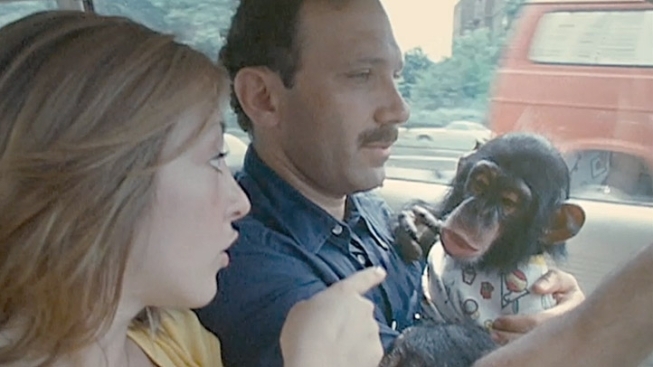 The latest film Oscar winner James Marsh ("Man on Wire") , "Project Nim," chronicles a Columbia University professor's ill-fated attempt to raise a chimp like a human baby, in an effort to teach it sign language. It's an experiment as poorly executed as Marsh's film is fantastic. In November of 1973 Prof. Herbert Terrace arranged for a former student, Stephanie LaFarge--who was married and had a Brady Bunch-esque menagerie of seven kids--to take in a young newborn chimp, Nim Chimpsky (named for famed linguist Noam Chomsky), and try to teach him sign language. Sitting here in the 21st Century, just two years removed from the horrifying chimp attack on a Connecticut woman that left her without a face or hands, it's easy to see that Project Nim was a patently bad idea. Not since Steve McQueen in "Papillion" has a captor suffered such an array of abuses and betrayals at the hands the hands of his jailers. Yet, as LaFarge's daughter notes with a rueful and embarrassed laugh, "It was the '70s…"
Like a lot of humans, Nim loved kittens, yogurt, booze and pot. But he also possessed the strength to grab you by the arm and beat you against a wall like rag doll, and could bite through your cheek in the blink of an eye. Watching Terrace recollect the whole thing, it seems pretty clear that he knows his behavior—with regards to both humans and chimps—during this time was something short of awesome. Yet he shrugs off his treatment of his students by saying, "Why not?," and at some point along the way, Nim becomes nothing more to him than a tool with which to acquire power and fame. Marsh is a brilliant storyteller, and the candor he teases out of his interview subjects is remarkable. And the way in which he weaves the interviews together with the archival footage drives home just how monstrously Nim was treated. Like any great story about animals, "Project Nim" is much more about humans—their frailties, vanities, indiscretions, blind spots, self-delusions—leaving you a little bit sad and a little bit angry that it took the suffering of a chimp to expose us for who we are. "Project Nim" goes into limited release Friday, July 8.